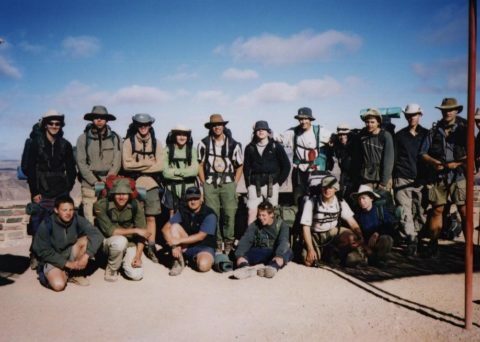 I am pleased to report that the blog for my month-long trip trip to Namibia with World Challenge Expeditions in 2002 is back online after being taken down temporarily since May. 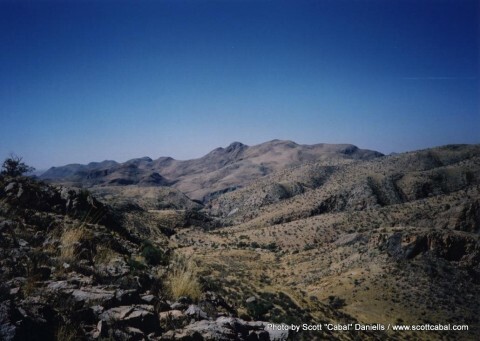 If you read the blog you will notice that there are some references to an anonymous group member, as opposed to naming the group member being talked about like I do most of the time, and that some photos have black boxes on them or are cropped to non-standard dimensions. Let me explain. Some of you will know the details by now, especially with the worldwide media interest generated by his story, but a member of the group who travelled with us to Namibia was recently convicted of some serious crimes that he committed while living abroad. 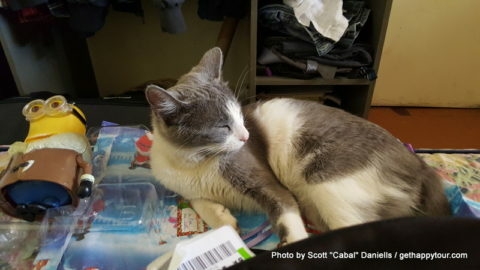 I won’t go into details, or mention him by name in this post, as I would prefer not to receive web traffic from the sort of people who might search for his name online. 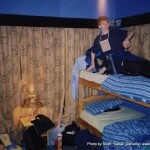 However due to the media interest over the summer I found it necessary to take the blog down to protect my own privacy. 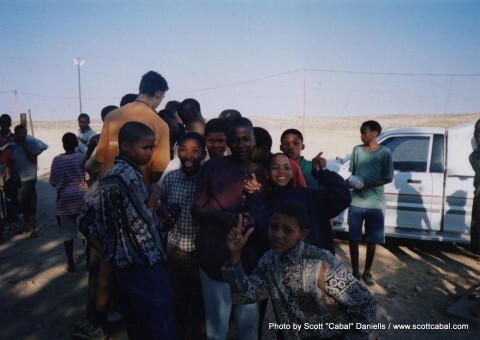 I now feel that sufficient time has passed since his conviction and so, 14 years to the day from our final full day in Namibia on this trip, I have returned the blog to my site. Where possible I have found new photos to replace ones that he was featured in but where this was not possible I either cropped the photo or added a black box to cover him in photos where he was recognisable. I have also removed his name from the blog itself. For the purposes of any media that may find their way to this blog, in the event of any future interest in his case, I have no information to give and will not be making any statement or providing any further information. However I will point out that the fact I have edited a 14 year old blog in ways described above should make my feelings about this issue perfectly clear. The original text of my blog has been archived to my computer should it be needed by anybody, for a valid reason, although the changes to the content itself were fairly minor other than removing references to the one group member. I am glad that I have finally been able to put my blog back online as this was an amazing trip, one which probably started my love of getting off of the beaten path and delving deeper into the culture of places I visit. Without this trip I would probably never have visited many of the places I have seen since, had some of great experiences that I have had or met most of the amazing travel buddies that I have met. 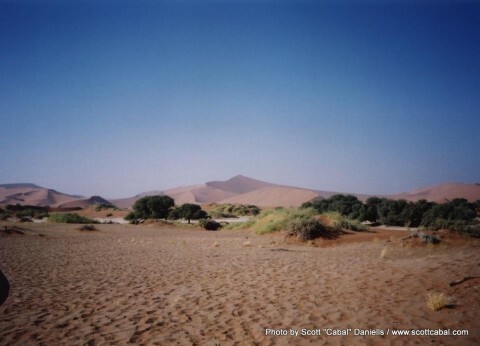 Plus the people and scenery of Namibia are great as you can see from the selection of photos below. If you have not read my blog from this trip then feel free to have a browse as I really enjoyed it. It contains details of our time improving the sports facilities of a school before travelling around the country seeing the sights and having fun. Sights and experiences from the trip include visiting Gibeon, Mariental, Hardap, Sesreim, Namib-Naukluft, and Windhoek in addition to trekking through Fish River Canyon and Dune Boarding in Swakopmund. It is a trip that I will remember for the rest of my life. Every time I travel it seems to take longer and longer for my travel blog to be posted online and this is definitely the case again now. Seven months to the day from the start of my memorable and highly enjoyable trip to Chile and I have finally managed to get it online. 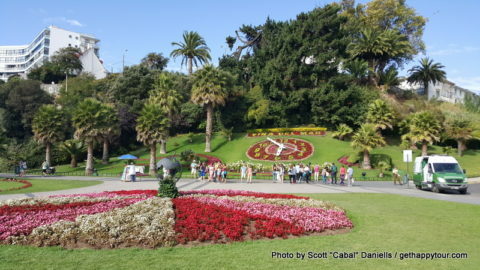 A photo of the flower clock in Viña del Mar, added to the top of this post for the purposes of my WordPress Facebook plugin. As those who follow my travel blog, or those who just happen to have read my previous entries, will know I don’t blog live while I travel for several reasons. Usually there is the case that when I travel I tend to visit places that are off the beaten path, or in some cases off the grid completely, meaning no chance to post live but more importantly I feel that this takes your concentration away from what you are seeing and experiencing. It is my opinion that when you blog live, either daily or periodically, while things may be fresh in your memory you will experience each day in terms of what you can write about in your blog rather than in terms of new experiences. As a result I write my blog in bullet point form and then, in collaboration with the photos that I took and the schedule for the trip, reconstruct my blog and type it up after returning. However a combination of the fact this was a trip to visit a friend, rather than an organised trip that had a schedule, and my current personal circumstances have resulted in extended delays which is a shame. However here it is… my 2016 Chile travel blog! Just read on on this page, or navigate to the “2016 Chile” category using the site menus, to read all about this great country. I won’t post much about my trip in this announcement message but to cut a long story shore I loved Chile and want to return again soon. The people, the food, the culture, the way of life, the climate, the atmosphere, the prices and the experiences that I have made me fall in love with the country very quickly. 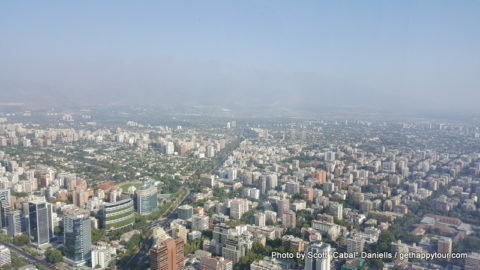 Even though I only visited Santiago and two cities fairly close by I know that Chile is a county that I want to visit again soon, maybe combining Santiago with another region such as Patagonia, The Atacama or Easter Island. 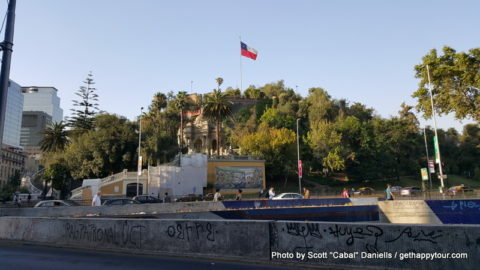 The blog I have written, since there wasn’t a set itinerary and we didn’t spend the whole time rushing from place to place, is written in summary format as opposed to my usual point by point account of what happened each day but I think it gives a good overview of my experiences in Chile. As usual there is no way I can finish with a boring list so here are a few of my favourite photos from the trip. The view from the very top of the hill at Parque Metropolitano. I hope that you enjoy my blog from this trip. I didn’t see much of the country compared to most people who visit but as usual feel free to message me if you have any comments, corrections, random messages or want to ask anything. I have been back in the UK for a few weeks now and as well as getting back into things here I have had a chance to process my thoughts and think back to my time in Chile. 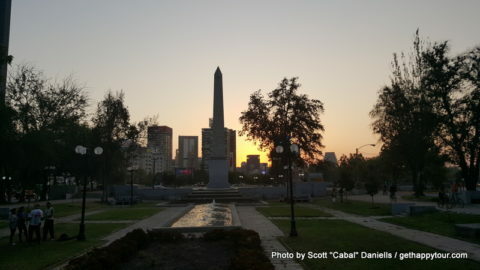 I generally always find it hard to readjust to being back home after a great trip, in fact this has probably been the case with every trip since China and North Korea in 2010, and Chile is no exception. 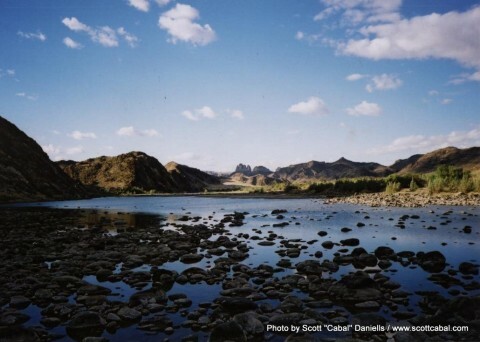 Latin America is a region of the world that has always fascinated me since I was young. To start with my main area of interest was Central America, specifically Nicaragua and Costa Rica, and I never had much of an urge to visit South America. However, after my visit to Central America in 2012 this changed as I realised I really like the atmosphere of Latin America. Of course every country has a different culture and identity, as the region is so big, but I started looking further afield and decided that one day I would like to visit either Ecuador or Chile before then exploring more of South America. So when I had the chance to visit my friend Steven in Chile I could not say no, and I am glad I went. This trip was slightly different to previous ones in that I stayed in a friend’s house and a rented apartment instead of hotels, I was visiting a friend instead of travelling on my own or with an overland group, and I went with no real itinerary compared to the fairly detailed plan that I usually have. As a result, my thoughts about this trip were always going to be different, and I was always going to end up liking this trip more, but I definitely really enjoyed my time in Chile. The people, the food, the experiences, the sights, the memories and the atmosphere have made this a trip that I will remember for a long time. Because I had no real plan we spent a lot of our time just walking around visiting places that Steven thought I should see, without having to be at a set place at a set time, and this meant that we saw lots of things that we wouldn’t have done otherwise. This part of the post is mainly for my benefit as I am in the process of creating a printed book with my travel blog for the past 10 years and don’t want to forget anything over time, and also to give me an excuse to post some of the photos from the trip that I have not had a chance to post so far. It may seem a little disjointed compared to the rest of this blog but it’s necessary. One thing I found out during my visit is how different the labour market, and related areas, are in Chile compared to those that I am used to in The UK. During one of my days in Santiago we were entering a metro station and passed an old lady who was playing a musical instrument and Steven explained that she is a retired teacher who can’t afford to live in the city on her pension and so has to busk on the street to get extra money. Near the Plaza de Armas there was also a big department store which was closed the entire time I was in the city due to a workers strike. Apparently the workers felt that they were not being treated properly so all went on strike, blockaded the store entrances and were making a large amount of noise. It seems that the labour market is a lot more controlled in The UK, in that workers have better protections but conversely there are more regulations about when and how strikes can take places. I mentioned it briefly in my blog posts about Santiago but every time I travel to Latin America I love how much more they embrace the outdoors compared to how much it is embraced in The UK. Things have improved a lot in The UK in the past 10 years, I think partly due to a change in culture but also partly due to the ban on smoking in indoor public areas which came into force in 2007 meaning more people have to spend time outside, but even in the summer we still don’t spend as much time outside as they do around the world. 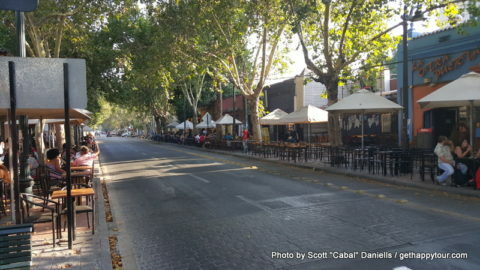 Santiago makes good use of its outdoor space, with a number of avenues, parks, plazas etc that would probably have been developed and sold off as building opportunities in The UK in addition to restaurants with a lot of outdoor seating. Patio Bellavista in Santiago, just off Pio Nono. Something that would not have been as apparent if I had stuck to the tourist areas and the centre of the city is the divide between the “haves” and the “have nots”. 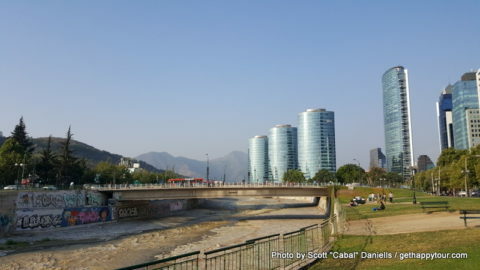 During my time in Santiago I had a chance to visit one of the affluent areas, Las Condes, and a couple of areas of the city where the average worker lives. The properties in the affluent areas and those in other areas, such as Las Condes, are almost a world apart from each other. 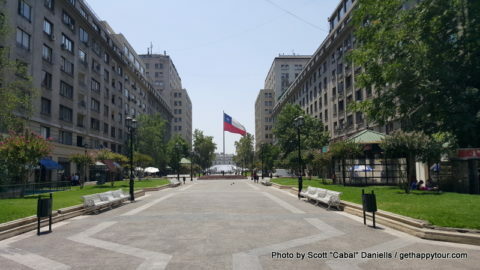 There is a divide in The UK, for example council estates vs Kensington, but it seems more noticeable in Chile. 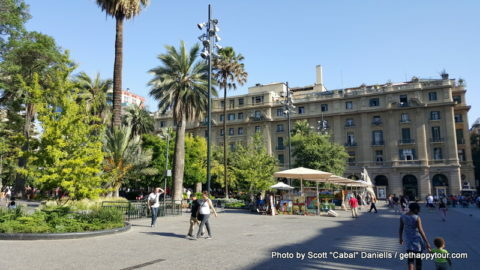 However, I enjoyed seeing the “real” Santiago, where the average Chilean lives, and would have hated sticking in the sterile affluent areas of the city for my whole time there as they have no character. 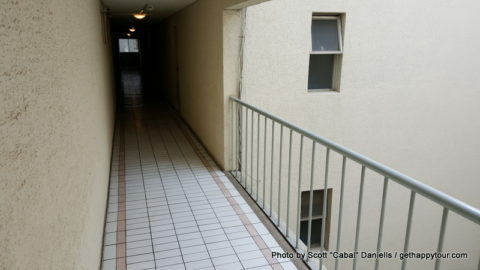 The apartment I stayed in was somewhere in the middle. It was close to the city centre but was small and functional and, as I mentioned earlier in this blog, was all that we really needed. 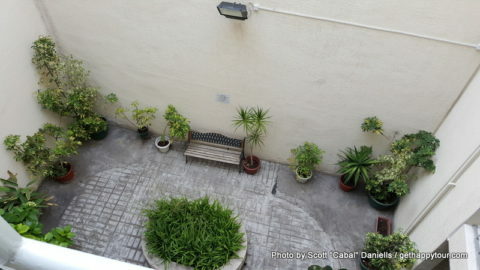 Here are a few photos, which I have not been able to include in the blog so far. Chile appears to be a country that, while discrimination is still prevalent due to the influence of the Catholic Church and historical prejudices, is progressing forward. For example, there have been homophobic murders, most notably that of Daniel Zamudio, and homosexuality was only decriminalised in 1999, but conversely there is a popular pride parade, a popular drag scene and a bill permitting civil unions was recently passed by the Chilean Parliament. The opinion of the Catholic Church still makes a big difference in Chile, so the country is behind many in the area on civil rights, but it appears that the people want to do something about it. There is crime in the country but I did not personally see any luckily and I overwhelmingly found it to be an open and welcoming part of the world. I don’t claim to be an expert on Chile when comparing the situation there to the situation in The UK, the above points are just my opinion based on what I saw during my time there and what I have heard by speaking to people that know more than me and it is possible I could be wrong on a number of opinions. My visit has peaked my interest in the country and I definitely want to learn more about it, both after returning to The UK and also by returning in the future. 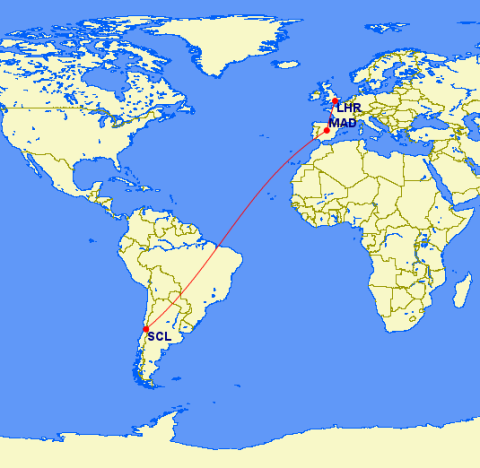 My current plan is to return again on my next trip unless something else comes up, either next year or the year after, and to spend half of the time visiting Santiago and the other half visiting other parts of the country. The scenery in this part of the world is so spectacular and in the future I would love to visit Patagonia, the Atacama Desert, the wine producing regions and Easter Island in addition to other countries in the area. I have no urge to visit Brasil at all at the moment, least of all Rio di Janeiro due to how dangerous it can be, but I want to see more of what South America has to offer. Before I return I definitely need to improve my level of Spanish so that I don’t have to rely on Steven when I am in the city, and so I can visit other areas of the country with ease. I studied Spanish to GCSE level at school but unfortunately didn’t speak it again for a number of years afterwards. I did some revision in advance of my visit to Central America in 2012, and have been relearning it for the past 9 months now, but I still have a lot of work to do. The only problem is that Chilean Spanish is very different to the Spanish that I have heard, in that they use a lot of slang and also have hard to understand accents. I watched a video that was posted on YouTube by some Christian Missionaries last year which said that most of the people from their mission who visit Chile don’t understand anything for the first month despite being proficient in the language. This is something that I want to work through, however, but it will require a lot of practice. Overall I would highly recommend Chile to anybody who wants to visit South America. You won’t be disappointed. While I have no plans to move out of the UK at the present time, as this is my home, Chile is definitely a country that I could see myself being ok living in if I was ever offered a work transfer at some time in the future. To finish, here are some final photos that I want to post on my blog but have so far been unable to use. Chile… I love you and really miss you but I will be back soon! Normally I consider paying extra for better seats a luxury or an unnecessary expense, with standard seating usually being adequate, but after my final flight home I think the ones I paid extra for were worth every penny. In total I paid in the region of 150 euros for an over-wing exit row from London to Madrid and front row exit row seats on the flights to/from Chile, electing to save my money and have a standard seat on the final flight from Madrid to London. Big mistake. 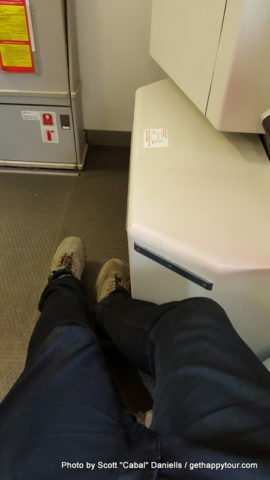 Never in my life have I had such uncomfortable seats and so little leg room, on any aircraft and with any airline all around the world including the North Korean state airline. The seat was uncomfortable and gave me a back ache, the head rest was too low for my height which hurt my neck and even spreading my legs as far as they could go without squashing the person next to me or tripping people over as they walked past my knees were still pressed into the seat in front of me so solidly that walking off of the plane upon arrival in London caused me a lot of pain. I am just thankful that the person in front of me didn’t even attempt to put their seat back or I could have sustained real injury. Apparently Iberia don’t think people above the size of small child travel on their aircraft. Another photo of the painful conditions I found myself in on Iberia. The flight itself was made worse by a large group of Uruguayan school children who, after hitting me in the face with their bags several times as they boarded, proceeded to be so loud that it gave me a headache. We also did not receive any drinks or food service for the entire flight due to severe turbulence which, although I am not affected by it usually, combined with the lack of food and drink made me feel quite sick. 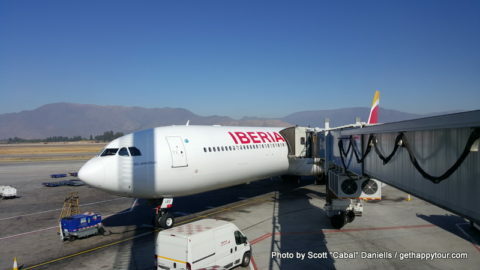 Neither of these problems were the fault of Iberia, but they made my uncomfortable conditions a lot worse due to the fact I couldn’t get up to stretch my legs, use the bathroom or drink any water to calm my stomach or head. 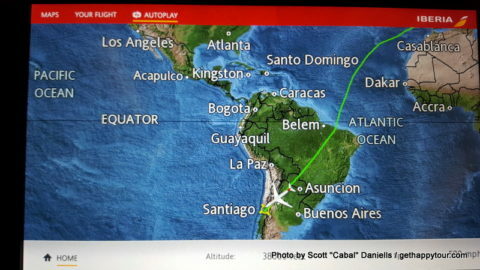 Although I guess in some way at least the turbulence meant that the Uruguayan kids couldn’t run around and annoy everybody like they did during the first 30 minutes of the flight as they had to remain in their seats. Maybe next time I will fly with a different operator, or via a different route, although if Iberia work out to be the best option again I will definitely book the extra leg room seats no matter what the cost especially for the transatlantic legs. No way could I have survived 13 hour flights in those conditions. Luckily the rest of my journey home was much better. After breakfast we left the apartment for our journey to the airport, which went fairly smoothly. 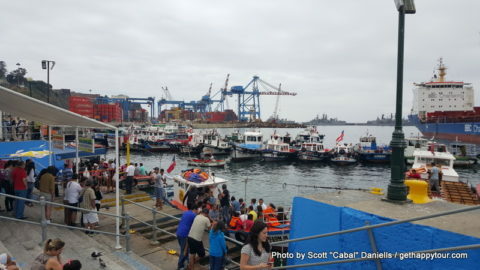 It was a short metro ride to Los Heroes, where the airport bus starts, and the next bus started boarding shortly after we arrived. It is a very efficient service, has a bus every 10 minutes during the day, and is cheap but I do wish they had more space for luggage. By the time everybody boarded the small luggage area on board looked more like a jenga tower. Hopefully they will extend the metro to the airport soon which will make the process even easier, but I had no real problems with the transfers. I was able to check straight in when I arrived at the airport which gave me a chance to have a quick lunch and final catch up with Steven. There aren’t that many food options at Santiago Airport, just a couple of cafes from what I saw, so while the airport seems to be very efficient don’t get here too early as you will end up frustrated. I always like to write about issues that I encounter when I travel just so that anybody reading my blog has an idea of what to expect. I don’t generally moan or complain about anything I encounter when I travel as it is only fair to play by the rules of the countries you visit, and my return journey from Kyrgyzstan to London last year was far worse than anything I encountered returning from this trip. However, the more information you have the more you are prepared and the more you are prepared the more you will enjoy your trip as you won’t let little things get to you. As I said though the extra leg room seats were worth every penny I paid. I had an extremely comfortable flight from Santiago to Madrid and, while I didn’t sleep for more than a few minutes, I arrived in Madrid refreshed and relaxed. 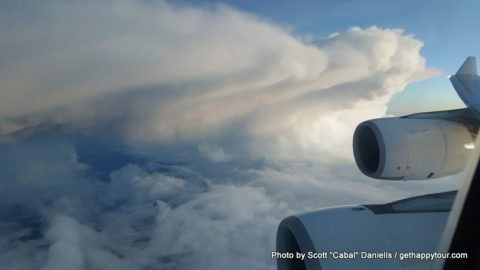 I saw some interesting cloud formations and watched some good movies but other than that the flight was fairly uneventful. Arriving back in your home city from a great trip is always a low point, but having been in Latin America for 11 days I almost had a culture shock when I got back to The UK. After leaving the aircraft it was well over an hour before I saw anybody smile and in that time I heard 11 people either shouting at people or having arguments with random strangers, in most cases over the smallest of things, and there was a severe lack of eye contact compared to Chile. I guess when you live somewhere you get used to the way things work, and the attitude of the population, but this enforces what I have said several times about travel being essential to personal growth and to opening you up to new ideas / cultures. The more you travel, especially off of the beaten track or at least away from tourist hotspots, the less things tend to bother you and the less you tend to rely on things being exactly how you expect them. That is my experience anyway, I don’t know about in general. 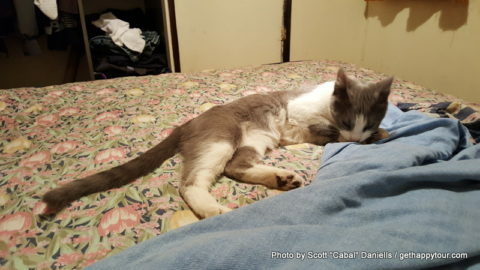 But for now it is time for sleep. It has been an exhausting but absolutely amazing two weeks which I have enjoyed immensely, and one which has made me fall in love with another country all over again. This is only the second time I have been to Latin America but I always have such an amazing time so I know I will be back. I don’t know when, I don’t know the countries I will visit and I don’t know what format my trip will be but I will definitely be back. So many good experiences and so many good memories. 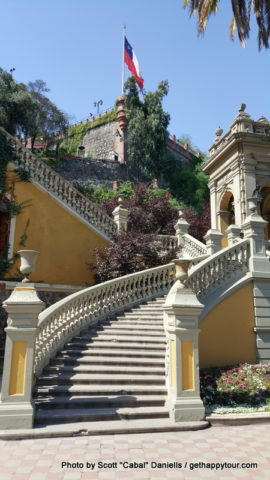 We spent one afternoon this week in the area of Quinta Normal, another of the main parks in Santiago, looking at museums. 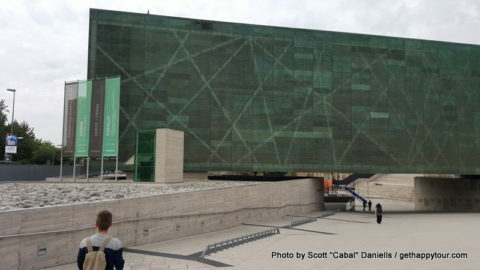 First on our itinerary was Museo de la Memoria y los Derechos Humanos, the human rights museum. I wanted to come here to learn more about the 1973 coup which installed Augusto Pinochet into power, and the atrocities committed during his dictatorship, as we don’t know much about them in The UK. 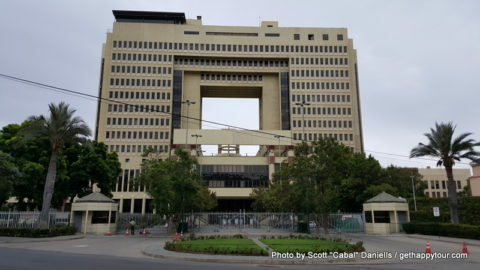 The museum contains a wealth of exhibits from the coup and dictatorship including previously unseen videos, letters from prisoners, newspaper clippings, military artefects, testimony from survivors and much more. It chronicles the time immediately before the coup all the way up to the return to democracy and is well worth a visit if you want to learn more about this dark period of Chilean history. I already knew some stuff about the Pinochet era, both from my own studies and from what Steven has told me, but seeing everything for myself and reading information in more detail was very eye opening. As you may know from reading my blog I have seen some pretty horrific things in museums, including gloves made from human skin at the war museum in Kiev and mass graves of hundreds of thousands of people in Rwanda, and while the exhibits weren’t as graphic here they still made me wonder how evil and twisted those in power can be. The museum also houses exhibits dedicated to peace and human rights in general in addition to a number of temporary exhibits. 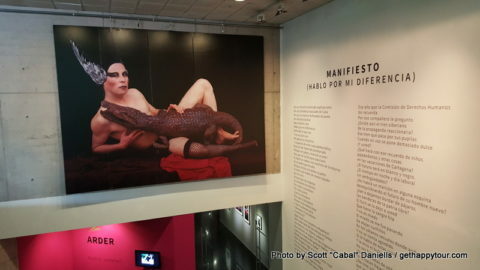 While we visited there was an exhibit dedicated to Pedro Lemebel, an openly gay Chilean writer and activist, which, although I had not heard of him before, was interesting to look around. Contained within Quinta Normal itself is the Natural History Museum. I have visited the counterpart in London many times, and the content of this one was nothing new, but it had a much larger focus on the flora, fauna and environment of South America from prehistoric to present times and if you are interested in learning more about the area then it might be worth a visit. The park itself is worth a visit at any rate, and I enjoyed my time there. I made it my mission to find some Sopaipillas while in Chile. 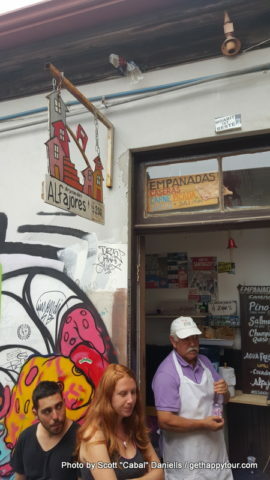 Sopaipillas, as described in my previous post, are a traditional street food consisting of fried pastry, which in Chile has pumpkin pastes as an added ingredient. I made some with Steven in The UK, and I have made some myself since then, so I wanted to try some while in Chile just to compare. Unfortunately, we couldn’t find any for the majority of the trip as they are primarily a summer street food but luckily yesterday we found some. 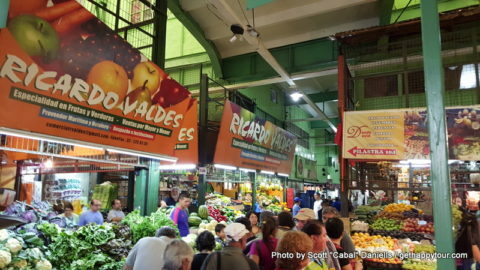 We spent some time looking around the Mercado Central, and surrounding area, before taking a local bus to the huge Parque Arauco shopping centre and right by the bus stop was a lady selling Sopaipillas. I have to say that the ones I made in The UK, even the ones I made myself, were so much better due to the fact these were most likely store bought or catering standard ones. 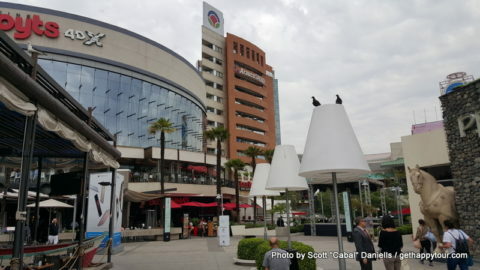 Parque Arauco was your standard designer shopping centre and, given that it is located within the wealthy neighbourhood of Las Condes, is full of international restaurants and designer brands. However, despite that, it was a nice place to visit. We spent some time looking around at the shops before eating at Ruby Tuesday and relaxing in Starbucks. Even though this was in a designer outlet the prices of food were still a lot cheaper than I am used to, for example two large steak meals with a few soft drinks each and a tip came to £30 which would not even buy one steak meal in London. The bus ride back to the city centre was interesting, however. We seemed to get a bus driver in a hurry and who swerved all over the place, driving extremely close to the car in front etc. This made us a little bit nervous and anxious so we got off the bus slightly earlier than planned, close to Pio Nono, but this area was closer to the apartment anyway. The past few days, since our day trips out of the city, have been less rushed than the first half of my trip. We have looked around a few museums and churches but we have also done a lot of relaxing, just walked around and soaked up the atmosphere, eaten some good meals and done some shopping which to be honest has been quite welcome. While there is a lot more I wish that I could have seen in the city, and I’m the sort of person who likes to fit as much in as I can, it was nice to do things differently and I know I will be back again. We did so much walking in the first half of my visit so on top of that I think that my feet needed a rest anyway. So here I am, at the end of my final full day in Chile. There has been a lot that I have seen that will probably have escaped my mind when typing up this blog, as it’s written in an overview style rather than being a point by point account of what happened each day like normal, so I will probably add an opinion and roundup post to my blog at some point after I return along with a few photos that I want to share but haven’t been able to include in these posts. 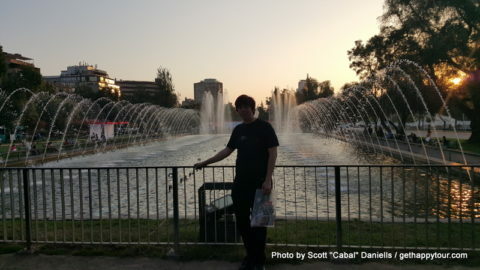 My time in Chile is almost over, and tomorrow I leave Santiago for my journey back home. I know I have said this a few times in the blog but I have had such a great time here and will miss the country when I leave. I don’t know whether it’s because I’m visiting my friend, because of the way of life, the atmosphere, the fact I am in an apartment so don’t feel like a tourist or the food but I suspect it is a combination of them all. I have mentioned the food of Chile quite a few times but now I’ll talk a little more about it before talking more about the second half of my time here. Overall we have eaten fairly simply while I have been here. Partly this has been to keep costs down, partly this has been due to the basic kitchen in the apartment and partly this is because it is what we have wanted to have. Overall the food has been tasty, cheap and good quality. A simple sandwich, typical of the food we made for ourselves in the evening to keep costs down. I started this trip with a couple of days of home cooked food at Steven’s house. I had two main meals there which were Pastel de Choclo, a sweetcorn pie, and Humitas which are similar to Tamales. While these were home cooked meals they were an indication of what was to come as everything so far has been filling and made with fresh ingredients. We have had a lot of empanadas since I arrived, partly due to convenience but also as I really love them. I have made empanadas myself and had them in Latin American cafes in London but the best ones that I have had have been in Chile. The ones you buy from the supermarkets aren’t as nice but we have had a few from street stalls and cafes and they were really nice. Also really nice was the food at a Chilean restaurant very close to Plaza de Armas called Nuria, which served a selection of typical dishes. We ate there a couple of times and I tried the Cazuela de Vacuno, which was a very tasty beef casserole, and Lomo de Vacuno a la Pobre which was beef, fries, onion and fried egg. 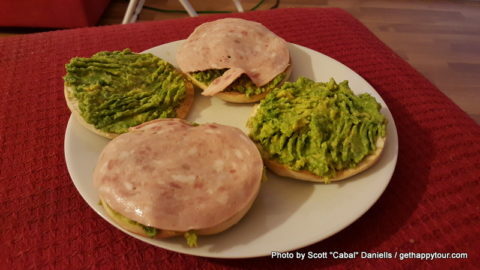 This sort of combination is very popular in this part of the world and I had something similar at a Peruvian takeaway near me but served with hot dogs instead of beef. 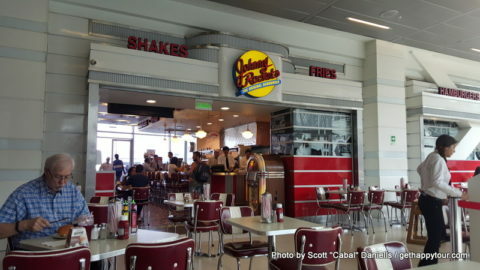 We have tried to stick away from international restaurant chains where possible, as they are overpriced and I wanted to try traditional food, but we did indulge in Johnny Rockets and Ruby Tuesday in various shopping centres. 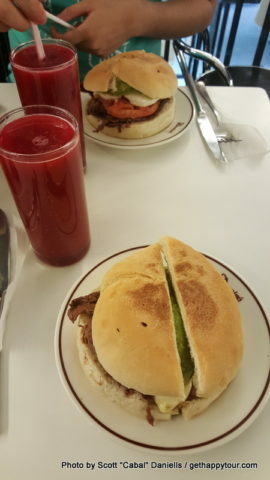 However, one restaurant chain that I did fall in love with was the Chilean fast food restaurant called Dominó, specifically their Churasco Palta which was a beef, cheese and smashed avocado sandwich. I asked to go back again as I loved the food so much and I can sense that I will want to make it myself when I return home. The food in the apartment has been simple, usually fruit and sandwiches with other occasional treats, but it has filled a gap. 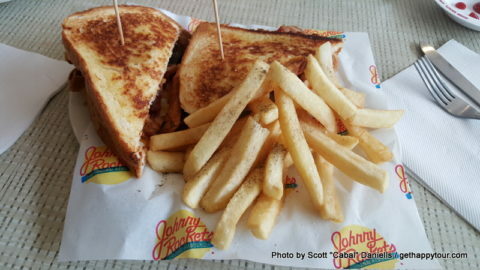 Johnny Rockets. I had heard a lot about it from my American friends so decided to try it. 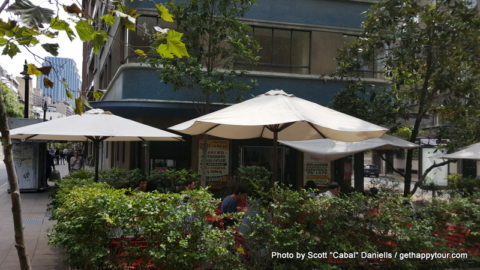 Street food is common in most places around the world, except maybe some western countries, and Chile is no exception. The summer months generally have more selection but all over Santiago we still found people selling completos, which are hot dogs fully loaded with huge amounts of toppings, which look very messy but are loved by Chileans. Sopaipillas, a fried pastry made with pumpkin paste, is another common street food in Chile although we didn’t find any on the streets for the majority of our visit. We didn’t try much street food during my visit, instead opting to rest our feet over lunch due to how much walking we were doing, so perhaps next time I visit I will try more along with the famous Terremoto cocktail which I didn’t have a chance to try either. 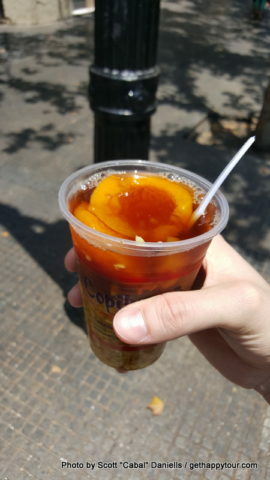 One thing I did try from the streets a few times was the traditional Chilean drink Mote con Huesillo which is a sugary, nectar-like drink containing dried peaches and barley. 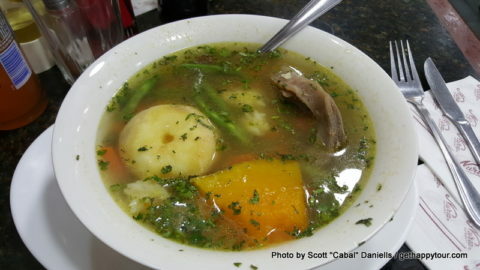 It is served with a spoon allowing you to eat the ingredients and then drink the liquid. It sounds horrible, and I read one blog online which described it as both looking and tasting like monkey brains, but I have to tell you it’s actually really nice. The first time you try it it’ll probably seem extremely weird, as we don’t have anything like this in Europe, but you will soon fall in love with it just like I did even though I don’t usually like peaches. 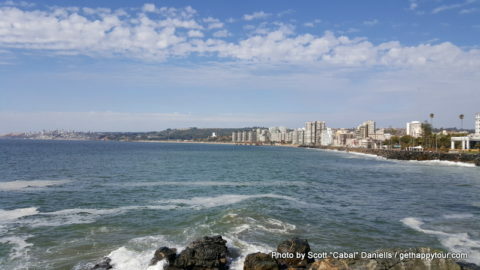 Today we took another day out of Santiago and busy city life to visit the coastal town of Viña del Mar, which came highly recommended by everybody from Chile that I spoke to before travelling. 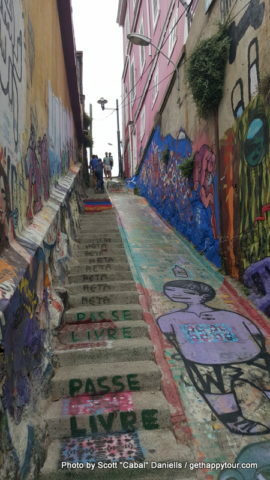 It was another long and exhausting day, just like Saturday when we went to Valparaíso, but I thoroughly enjoyed it. 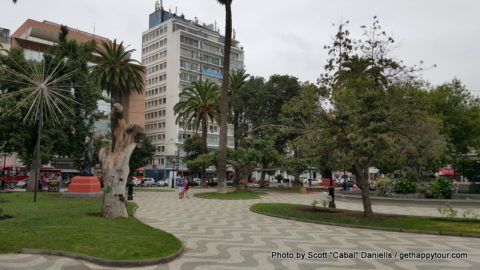 Viña del Mar is close to Valparaíso, in fact when you are in one town you can see the other on the far side of the same big bay, and they also share a tram network but they have completely different atmospheres. 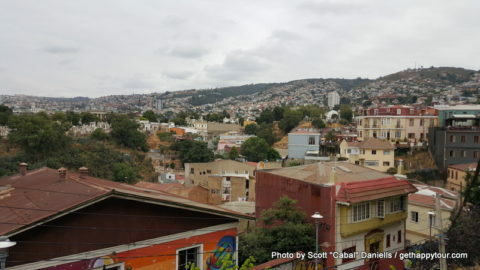 Valparaíso, as I described in my previous blog post, is a good place to visit if you are looking to learn more about Chilean culture and history, see some street art, learn more about the Chilean government etc and Viña is the place you go if you want to take in the coastal way of life and visit the beach, although it does have museums and is the location of the world famous Viña del Mar music festival so you can take in plenty of culture there. We decided to take a different coach company today as the prices with the company we travelled with to Valparaíso, Tur Bus, were a bit more expensive to Viña for some reason. This meant leaving from a different bus terminal a few minutes walk away from the main one, but the journey time was no different. Overall, as long as you don’t take one of the ultra-cheap companies, there doesn’t seem to be much difference between coaches. Both Tur Bus and Condor had comfortable seats, with plenty of leg room, left on time and seemed efficient. Steven says there are plenty of budget coach companies who have various levels of service, punctuality, and safety so it’s probably best to stick to the bigger operators where possible. 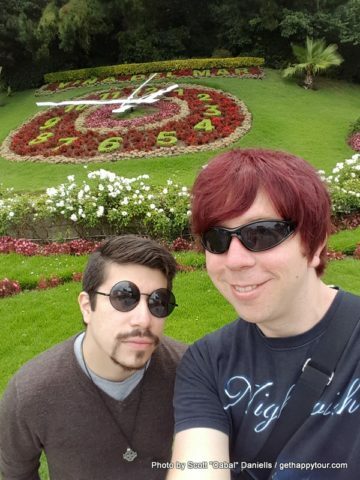 After arriving at the bus station in Viña del Mar we headed straight to the town’s most iconic and recognisable sight, the Reloj de Flores (Flower Clock), which as its name suggests is a working clock but with a face made up entirely of flowers. Here you will find locals and tourists alike taking photos and selfies while enjoying the sun and the atmosphere, and of course we followed suit taking some photos of ourselves. 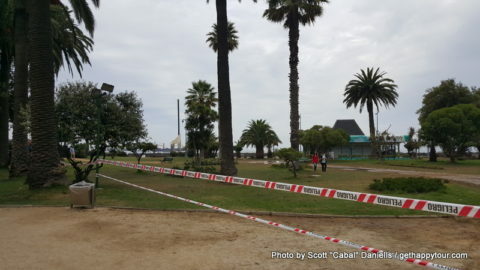 This seems a good place to start if you are visiting the town by bus as it is very close to the beach, bus station and a number of shops / restaurants. A photo of the flower clock later in the day when it was better weather. The beach was our next stop. Unfortunately, there have been some storms out at sea caused by the El Niño weather phenomenon so the sea was unsafe to swim in, in fact there is a large part of the coast in the town that is completely closed off due to large waves which have been causing flooding and even overturning cars. We decided to walk north along the coast road to this area, near the casino, to take a look at the waves and while the conditions are much better than they have been in recent days they were still powerful enough to get us wet while we were watching from a high vantage point. 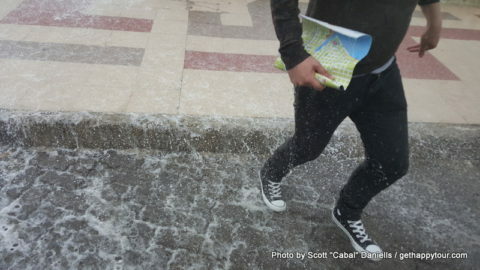 The whole area near the casino was closed as the waves kept flooding it. 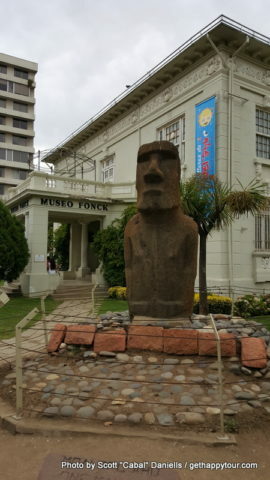 Since I would not be visiting Easter Island on this trip one place I definitely wanted to visit while in Viña del Mar was the Museo Fonck. This is a small museum within an old colonial house with two main sections, one dedicated to Easter Island and another dedicated to natural history, which while small is well worth a visit. Like many of the smaller museums in Latin America some knowledge of Spanish is definitely helpful, in the case of Museo Fonck they had attempted to translate a number of information boards into English but appear to have done so using an online translator so some of it I couldn’t understand and I just read the original Spanish text instead. 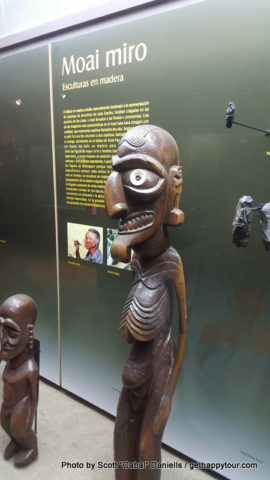 We spent some time looking at the exhibits and learning more about the history and culture of Easter Island, and visiting has definitely renewed my interest in travelling there during a future trip. 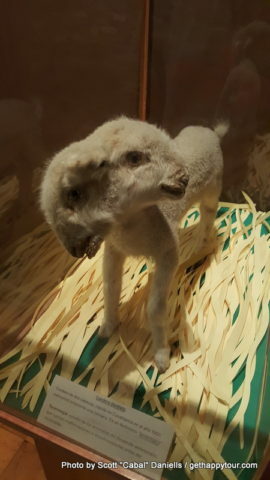 The natural history section upstairs is fairly boring and standard but it did have a large collection of deadly spiders and various bugs, as well as a two-headed sheep, and it’s possible to waste some time here if you need to before going to your next destination. 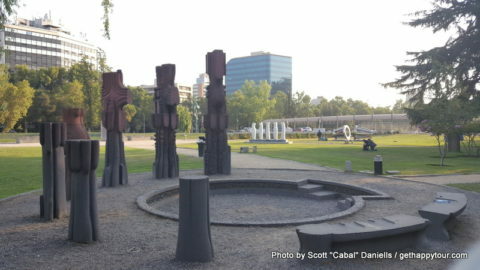 Overall I found the Easter Island exhibits, and the Easter Island statue in the grounds outside, much more interesting. Empanadas were on the menu for lunch today, as they have been many times since I arrived in Chile. In The UK the thought of having pastry repeatedly wouldn’t seem like a good idea but they are a convenient traditional Chilean snack, generally of good quality, affordable and quick to eat. However, the main reason we chose them today was because I read online that one of the best Empanada cafes in the region was in Viña del Mar and so I wanted to try them. Overall they were nice, and they were definitely the best I have had so far on my trip, but I wouldn’t say that they were “out of this world” or any other similar catch phrase. 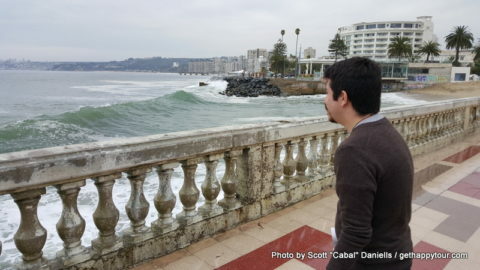 Viña is one of those towns where you can easily people watch and soak in the atmosphere and so we decided to rest our feet and regain our energy at the local Starbucks near the casino. Starbucks in Chile is a similar price to Starbucks the UK so by Chilean standards it’s extremely expensive, but as is the case with most international brands it is always really popular and so there has been a queue every time we have stopped at one. The atmosphere in this town is really nice and, although it is very touristy and full of gypsies, I would highly recommend a visit here if you are looking for a break by the sea for the day or a weekend. 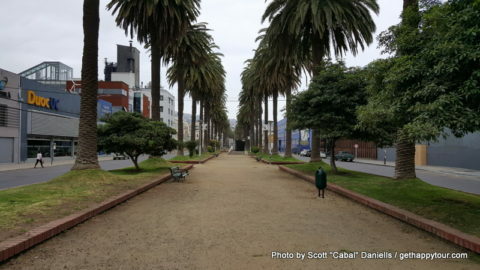 Chile has a very long coast line so there will be areas which are more pristine but Viña is very close to Santiago so is convenient if you won’t be in the region for long. 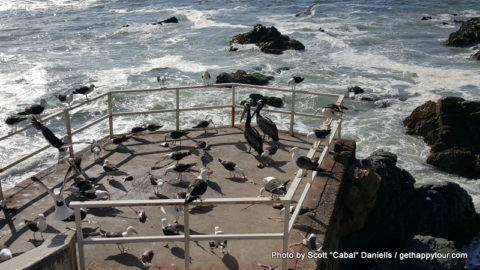 Sea birds in a feeding frenzy after fishermen dumped loads of fish bits on a viewpoint. We didn’t want today to be too rushed and so spent most of the rest of the day just walking around and taking in the sights before relaxing in the Quinta Vergara, home of the famous music festival that I mentioned earlier. It is a nice place to relax, go for a walk, have a picnic or just to get out of the sun and I enjoyed my time here waiting for our coach. It was definitely a lot more preferable than waiting in the coach station for an hour. 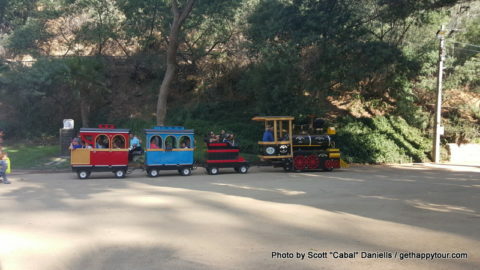 There is a little train that does tours of the park so it must also be very popular with children, although most of the people there when we visited were older. 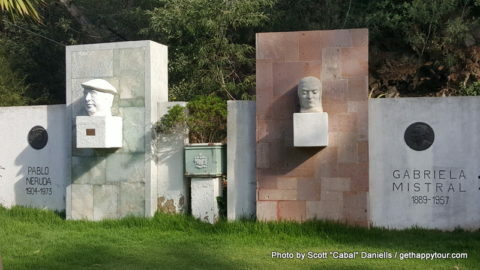 Busts of famous Chilean people in Quinta Vergara. 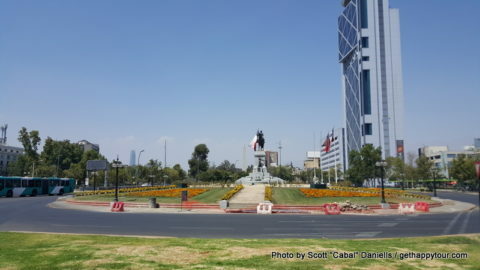 Tomorrow begins part two of my time in Santiago, and the final stretch before I unfortunately have to return home. Today is a bit of a rest day, due to the long day yesterday. Steven has gone back to his house for a little while and I have decided to do a bit of walking around on my own for the first time since arriving. 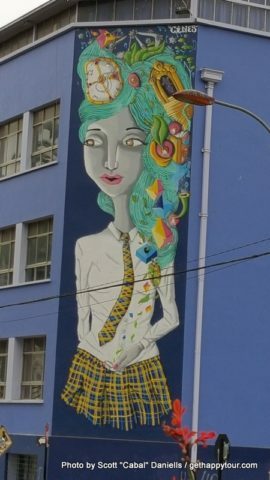 I didn’t stray too far from the apartment as I have the only key but I reloaded my payment card for the Metro, did some walking around the local area and I am now in Parque Forrestal eating some lovely ice cream from Emporio La Rosa and thinking about the really fun day yesterday in Valparaíso. My plan after here is to walk back to the apartment, look at the craft market near Cerro Santa Lucía to see if I can pick up some souvenirs, and buy some more fruit from one of the street sellers. The coach journey yesterday was fairly painless, much to my surprise. I am tall person and in the majority of public transport in The UK I never have enough leg room, regularly having to sit sideways in seats or endure the backs of seats smashing into my knees, but this was not a problem in Chile. The coach that we took was very comfortable, had plenty of leg room, and made the journey to Valparaíso enjoyable. 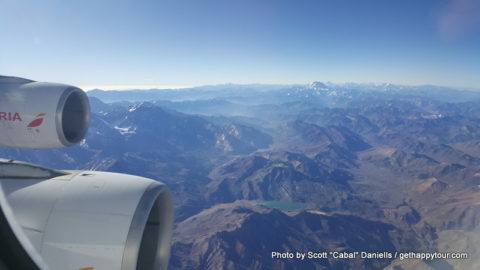 Even though we only travelled 90 minutes outside of Santiago it was nice to see more of Chile and the scenery, although not as breath-taking as what I saw from the plane, was really nice. 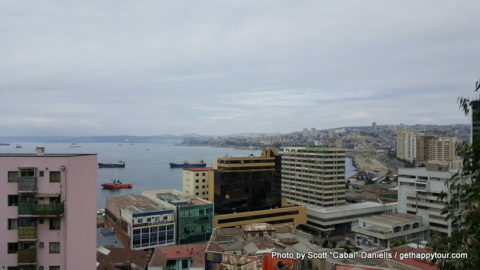 Valparaíso was a nice town to visit. 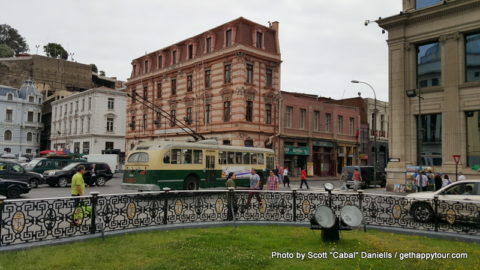 The main bus station is a little way outside of the main area of the city so you either have to catch a trolley bus or walk, but either are good options. We decided to have some breakfast in a food court above a market very close to the bus station before walking into the historical areas. The walk into the main part of the city takes you past a lot of industrial units, so I really wouldn’t recommend it at night time, but it gives an insight into the origins of the city. 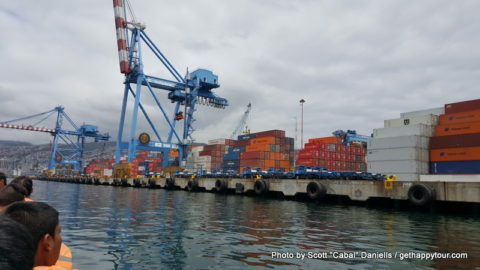 Dating back to colonial times Valparaíso has always been an important port and industrial centre, although this has somewhat declined in recent decades which is why the Chilean Parliament was moved here some time ago in an effort to promote regeneration. Although even in the industrial areas something that is very apparent is that the city is full of street art. I will call it street art as opposed to graffiti because this genuinely is art as opposed to the random mess that can be found sprayed around European cities. 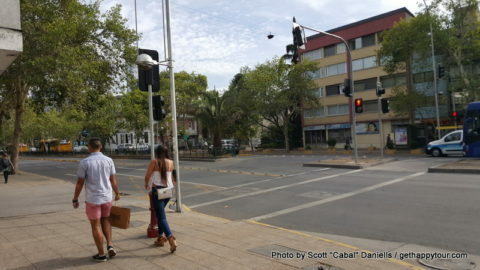 Walking towards the centre of Valparaíso. 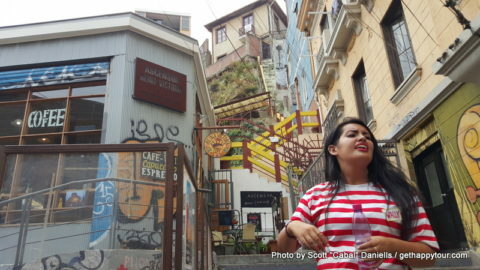 One thing that proved very helpful in Valparaíso is that there is a company called “Tours for Tips”, and they run two different tours of the city in both English and Spanish. As the name suggests you can give them what you want, based on how you found the experience, but most people gave in the region of 10000 pesos (approximately 10 pounds) each. I believe that they also operate in Santiago but I won’t need to use them there. We decided to go on the afternoon tour, but there was still some time before it started and so we decided to go on a boat tour of the harbour. There are a few companies that provide this service and they all depart from Muelle Prat, very close to Plaza Soto Mayor. 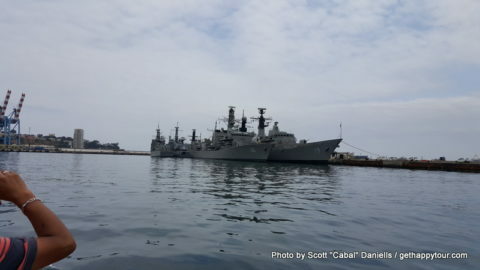 Live commentary is provided only in Spanish but from the boats you are able to see the city from a very different perspective as you are told about the history of the city, have landmarks pointed out, are told about the Chilean Parliament and shown the Navy ships in the harbour. 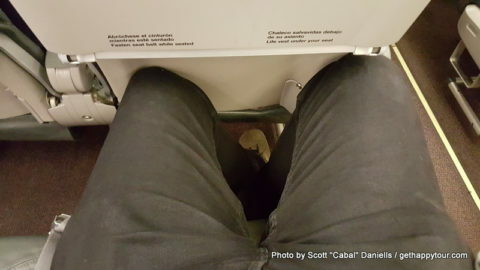 It was definitely worth doing, but the only problem was the leg room in each row was probably 15cm less than what I needed to be able to sit comfortably and as a result I was in some serious pain by the time we returned to dry land due to my knees being badly crushed by the seat in front. The average person would most likely find the leg room adequate. There was time for some souvenir shopping and a cold drink in Starbucks before it was time to head for our walking tour. 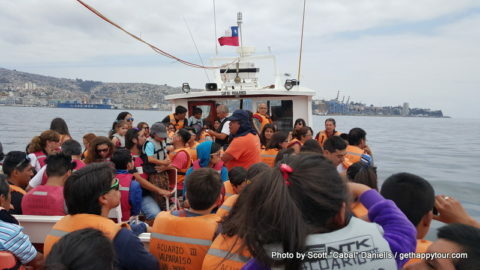 No booking is required for the tour, just wait next to the Monumento a Los Heroes de Iquique at the prescribed time and keep an eye out for people dressed up in red and white striped tops which make them look like Wally (Waldo for any Americans reading this). 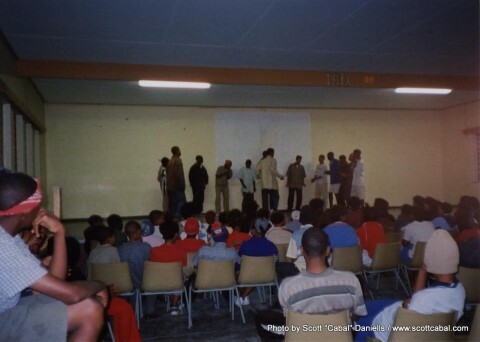 They will divide the groups up accordingly depending on how many people require each language and you will then head off in different directions. Our tour guide was a very knowledgeable young lady who had recently returned to Chile after some years living in Spain, as was obvious from her accent even before she told us. The walking tour lasted a few hours and took us up into the UNESCO World Heritage area which is extensively covered in street art. After riding the funicular up the hill you are told a lot about the history of the area and how the people pushed for UNESCO recognition in order to preserve the character of the area but how this has backfired. I won’t go into too much detail as you should go on the tour yourself, but to cut a long story short the UNESCO recognition requires that any building work be done in the original style using original materials. 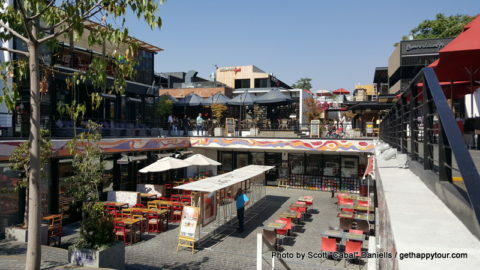 This has helped to maintain the unique character of the area but has resulted in building work being prohibitively expensive for many people. We also saw an example of the damage it can do to the area – there is an area which burnt down some years ago but where the owners have been unable to rebuild due to the cost of original materials and as a result the area has been left as a wasteland. Overall the walking tour was very enjoyable. We saw lots of nice sights, saw some great art, were introduced to local delicacies during a rest stop half way through, and heard a lot about the history of the area. The only part that I thought was unnecessary was the final stop of the tour, at Tours for Tips HQ, where they do a presentation to try to sell you other tours and try to bribe you to sign up with homemade spirits. There is no obligation to sign up, and for us it would have been pointless as we were only in the city for the day, so we just tipped our guide and left. 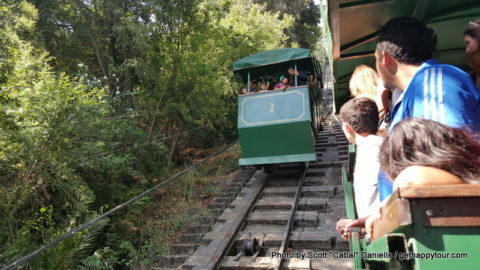 The Funicular, named after Queen Victoria. 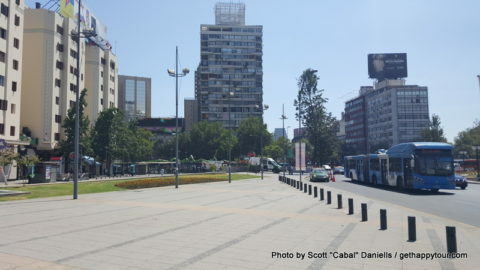 There were still a couple of hours remaining before our coach back to Santiago but by this time our feet were hurting, so we decided to catch the trolley bus back towards the main bus station and to try to find something to eat. 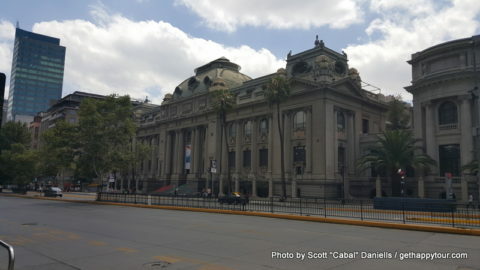 Even though it was not very late we had trouble finding anywhere that was still open so, after taking some photos of the Chilean Parliament, we made our way to a shopping centre in order to grab some food for the apartment and have some snacks in the food court. 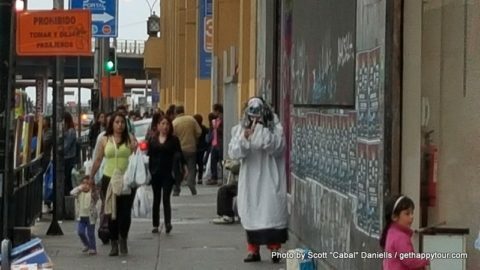 The remainder of the day was fairly uneventful, except for seeing a street musician dressed up with a scary mask. Apparently he is well known in Chile, or at the very least infamous, so he was interesting to see. The coach ride back to Santiago was smooth and after eating the empanadas we bought in Valparaíso we had an early night in order to not be exhausted today. I am not sure what we will be doing later today when I meet back up with Steven but it is likely that we will just take it easy. We have done a lot of walking over the last few days so it will be nice to take a break from it and have an early night in order to conserve our energy. 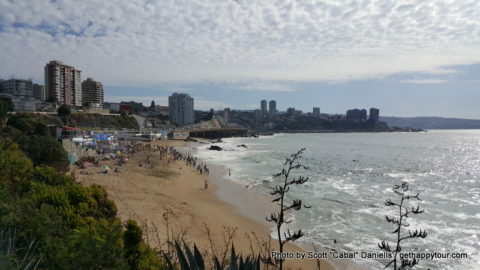 Tomorrow we travel to Viña del Mar and as we will be out of the city for the whole day it is likely that we will end up exhausted again. 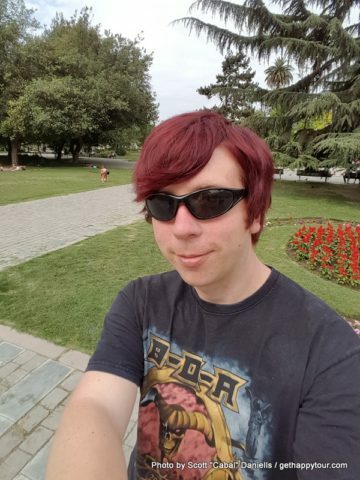 I have been in Santiago for most of a week and I am having a great time. 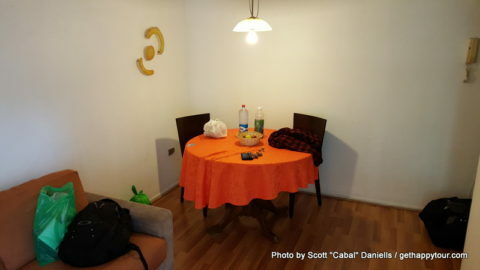 Staying with Steven in a rented apartment in the city has proved useful as we have been close to everything, have been able to keep costs down and I feel that I have been able to see more of the “real” Chile, compared to if I had decided to stay in a hotel. 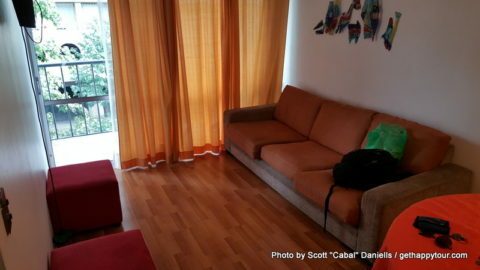 The apartment itself is not the best compared so some I saw online but it is adequate for my needs. 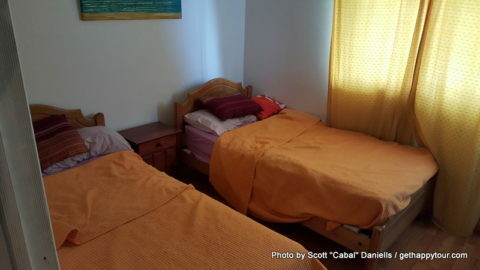 It has a living room with dining table, a small but functional kitchen, a clean bathroom and a bedroom with two single beds. The cost was approximately £190 for the 8 days that I am here which, given its location, I find very reasonable indeed. The only downside is that due to interference from the fire station across the road reception on the TV is very bad. 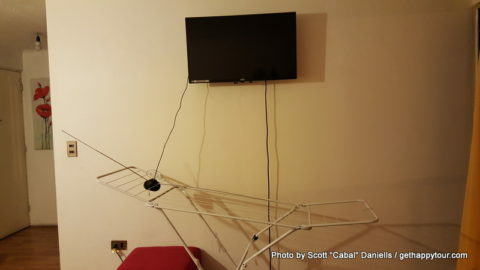 However, my past existence as a radio scanner enthusiast taught me that there is always a workaround available, in this case attaching the external antenna to the clothes airer in order to create a giant antenna. On the other hand, in addition to the location, it has the added benefit of being in a gated compound that has people on the gate so it should be fairly safe. I have spent most of my evenings making home cooked meals and watching Chilean TV / Netflix with Steven. 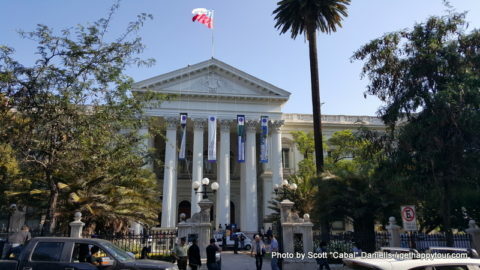 I am learning Spanish at the moment but as I quickly found out upon arriving here Chilean Spanish is very unique, with its frequent and almost exclusive use of slang words, that it is very difficult to understand. Fortunately, many of the programs on TV are from the USA and I have discovered an interesting Judge Judy style show called “Caso Cerrado” which has helped me practice. Although that is enough about the apartment. 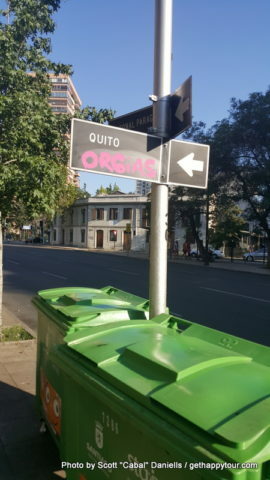 Santiago seems a really nice city. I have spent my days exploring and walking around with no real plan, checking out some of the sights, eating some good food and just generally having a good time. 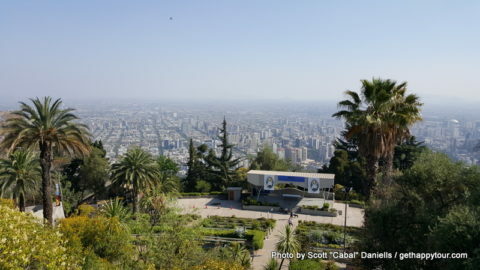 Cerro Santa Lucía is a good place to visit when you first arrive in Santiago. It’s a hill close to the centre of the city which gives you a good view of the local area. 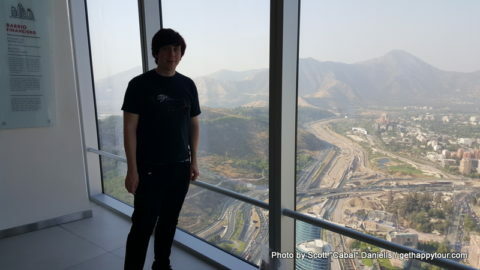 It isn’t as high as Parque Metropolitano, and definitely not as high as the viewing platform of the Costanera Centre, but I enjoyed my time here. Fuente Neptuno and the grounds definitely provided me with some good photo opportunities. 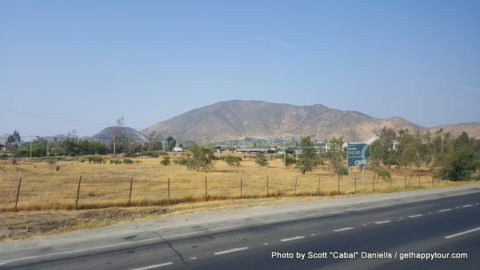 Cerro Santa Lucía as seen from the main road. Parque Metropolitano is another good place to visit if you are looking for a view point in the city. You can either walk up the hill or take an old funicular lift and are presented with some great views. There is a giant statue of the Virgin Mary here as well as a church, and it’s well worth a visit. Just be careful on the steep steps leading up to the statue – I slipped over and hurt my shoulder, much to the amusement of the only American tourists that I saw the entire time I was in the city. If you like the bar scene then head in the direction of Parque Metropolitano anyway as the road leading to it from Plaza Baquedano, called Pio Nono, is full of bars, restaurants and clubs and is very popular with university students from what I am told so should have a good atmosphere in the evening. 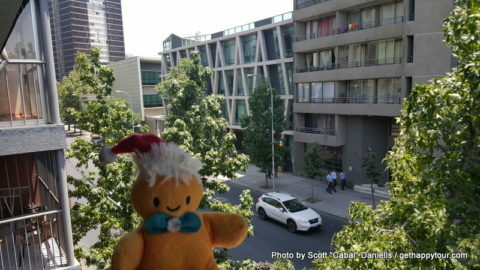 The Costanera Centre provided me with the best views of the city, although being inside a shopping centre it is very sterile and expensive. 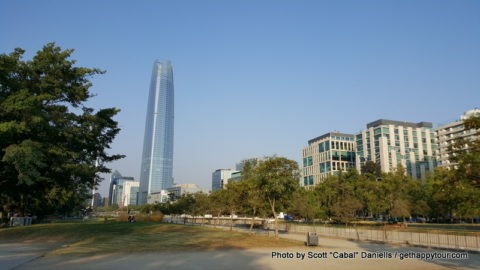 The Costanera Centre can be seen from all over Santiago, as it is the tallest building in Latin America, and consists of a huge shopping centre combined with offices, a hotel and the viewing platform. 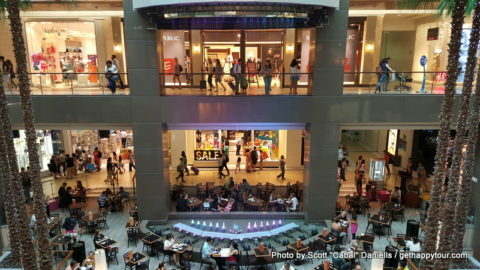 The shopping centre contains a few local brands but mainly big international brands and so for me was nothing special. 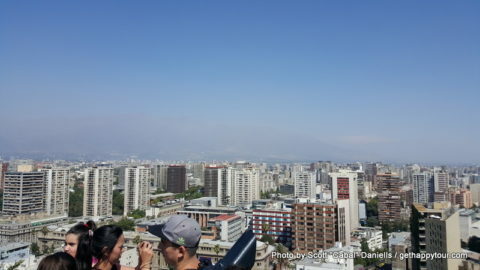 The viewing platform, called the Sky Costanera, can be accessed from the basement and is the highest view point in the city. You are shot up to the top of the skyscraper in elevators really quickly while you are told the history of the building in Spanish by the attendant. The viewing platform has telescopes to allow you to see things in the distance, but other than that I will let the photos do the talking. 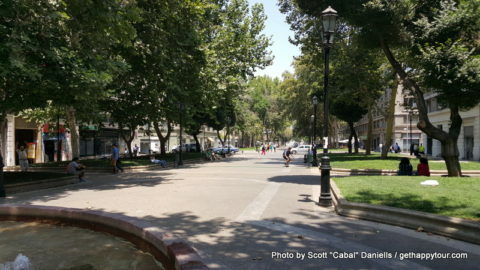 Santiago has a really nice atmosphere. 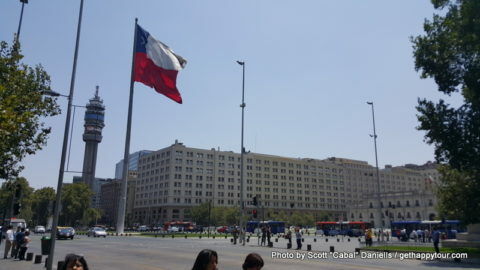 In addition to the viewpoints mentioned above we spent the first half of my time here walking around and taking in the famous sights such as La Moneda, which is the Presidential Palace which was infamously bombed by the Chilean Air Force during the military coup which killed President Salvador Allende. More about that coup later on as I am planning to visit the Museum of Human Rights before the end of my visit. 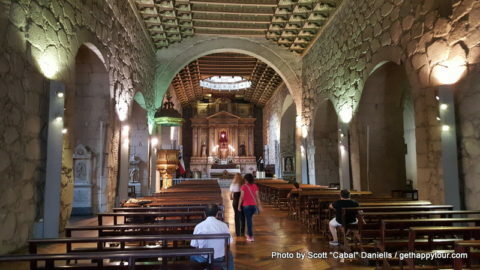 Other sights that I have seen so far include Plaza de Armas, the Metropolitan Cathedral, Iglesia San Francisco, The National Library and the Violeta Parra Museum which was brand new when I visited. 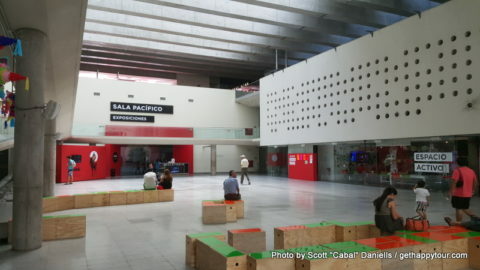 We also visited the cultural centre contained in a basement underneath the plaza next to La Moneda. 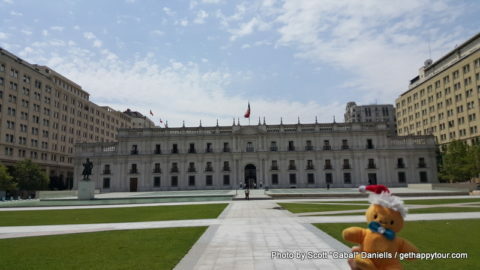 I would highly recommend all of these sights, maybe with the exception of the National Library which we only went into in order to get out of the heat, as they all show a little bit of Chilean culture and history. 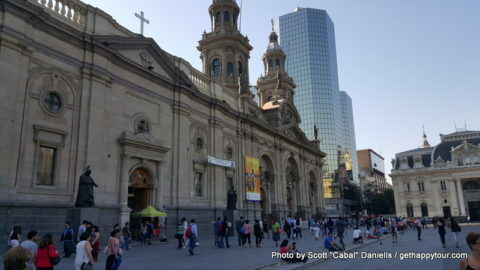 One thing that you will notice in the city is the large number of churches and cathedrals, as Chile is a fairly religious country. Some of the churches are fairly basic but some are really impressive such as the Iglesia San Francisco, which is very close to La Moneda. I believe it is the oldest church in Chile and is beautifully decorated, and well maintained as we found out when a cleaner asked Steven to help her lift some of the heavy cleaning equipment up some steps in order to help maintain a chapel. I have heard a lot about Violeta Parra from Steven, and if you read much Chilean history it is very likely that you will have heard of her too as she is somewhat of a national hero that helped put Chile on the map and develop the Chilean folk music genre. I won’t go on about her too much as I don’t want to get any details wrong but if you want to learn more about her then the museum, very close to Plaza Baquedano, is well worth a visit. It is free to enter and showcases a lot of her work including original lyrics sheets, her guitar, photos of her and her art work. It also tells you more about her life, from her humble origins all the way up to her tragic suicide. A word of warning though, at the time I visited the museum was completely in Spanish but the information was easy to translate. 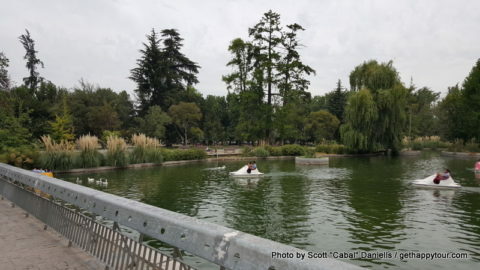 One thing I love about Santiago, in addition to the climate, people, and the atmosphere is the large amount of open space and the number of parks despite being a populated city surrounded by mountains. Parque Forestal, Parque Uruguay and Museo Parque de las Esculturas are among the open spaces that I have spent time in so far, most of which have been situated along the river. 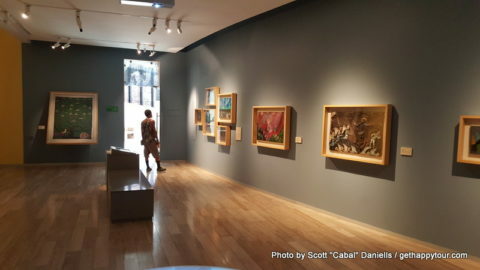 Museo Parque de las Esculturas is worth a visit as is has a great atmosphere and a large selection of public artworks, perhaps you could visit it when walking back from the Costanera Centre like we did. Parque Forestal is very central and seems to be a place where people like to go to relax at weekends and during their lunch breaks. I visited here a couple of times and during the first visit I was taken to what has quickly become my favourite ice cream parlour in the entire world, Emporio La Rosa. If you like ice cream then come here and take some into the park, I cannot recommend it highly enough. I have fallen in love with lúcuma flavour, although as it’s a local fruit I doubt I will be able to find it in The UK. We are due to take a break from city life over the next few days and have booked a couple of day trips out of the city in order to see more of the country. 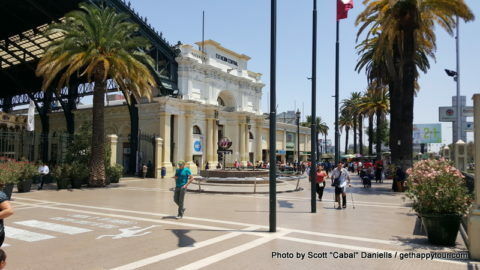 Tomorrow we visit Valparaíso and then on Monday we visit Viña del Mar, which are both on the coast approximately 90 minutes from Santiago. The intercity bus service in Chile seems a LOT more extensive and efficient than that in The UK. If you want to visit either of these towns, or indeed other ones locally or further afield, then just head to the Estación Central and you can buy tickets inside the bus station next door for all of the major companies. Alternatively, I have seen kiosks dotted around the city for all of the companies if you won’t be going near Estación Central, but going there allows you to check prices and schedules of all of the companies. I am looking forward to both day trips. 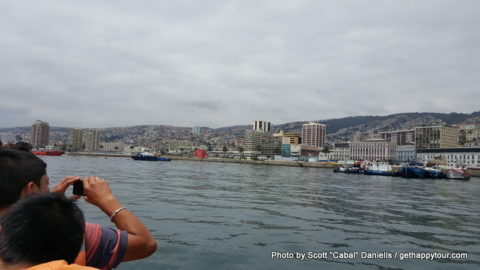 Valparaíso is a city that I have heard a lot about and Viña del Mar comes highly recommended by everybody from Chile that I have talked to. Welcome to Chile! I have just checked into the apartment where I will be staying for the next 10 nights and it’s really close to everything. It looked a little far out on Google Maps but my friend assured me it was central and he was right – the nearest metro stop is less than 5 minutes walk away, and it’s only 10-15 minutes walk to what I would class as the centre of the city. 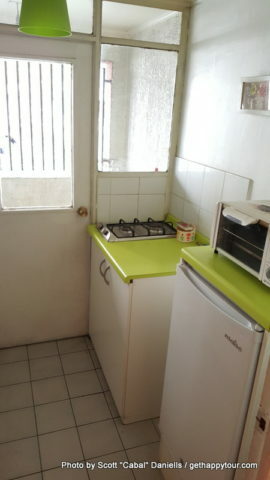 The apartment is basic but we don’t need anything fancy just somewhere affordable, safe and central. The owner seemed nice, and she even bought us a selection of fruit as a welcome gift, but other than when she took payment we won’t see her again. This is my 3rd day in Chile and for the past few days I have been staying at my friend Steven’s house in La Granja, a residential area to the south of the city. The idea of me staying there was to see where Steven lives, meet his family, play with his cat and just relax after a long flight. Oh my what a long journey it was. 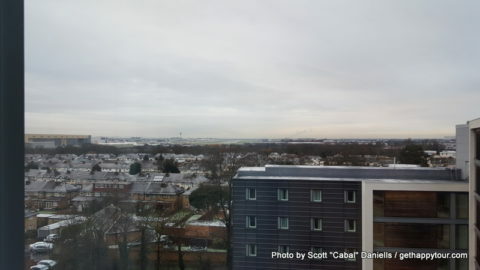 I decided to book a cheap Travelodge near Heathrow the night before my flight, even though I didn’t depart until mid-afternoon, as being a weekend I didn’t know about engineering works and also as I just wanted to relax. I’m definitely glad I chose to spend the night as there was so much engineering on that I had to take 2 trains, 3 tubes, a bus and do some walking to get there, compared to the usual 1 train and 1 tube plus a small walk, which would have been stressful on the day of the flight. I knew I would have 24 hours of travelling ahead of me the next day, including a 13.5 hour flight, so all I did at the hotel was relax in the restaurant and then watch TV. Waking up to snow on the morning of my flight to Chile via Madrid. 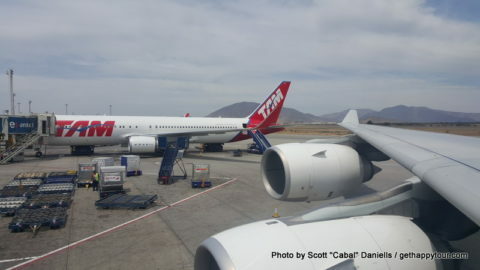 I woke up on the morning of my flight to be greeted with freezing temperatures and a covering of snow on the ground which, considering I had not taken any thick jackets due to travelling to South America during their summer, made me look forward to my trip even more than I already was. Transport that day was a lot smoother than the day before and I got to the airport, checked in and boarded my first flight to Madrid with ease. Upon arrival at Madrid I was transported by shuttle bus to the non-EU section of the airport ready for my flight to Chile which, luckily, was on time. There aren’t many options for food at Madrid airport from what I have seen, just a couple of cafes, fast food outlets and a Starbucks but I passed the time eating in a cafe and using the free WI-Fi in Starbucks. Then it was time for my 13.5 hour transatlantic flight. 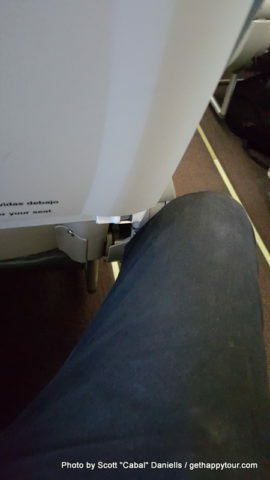 For the whole outbound journey, and the transatlantic portion of the return leg, I have booked extra leg room seats at a cost of 150 euros total but it seems that it was worth every penny as Iberia, who I’m flying with, seem to have some of the worst leg room I have ever seen. On the way to Madrid most people had their legs pressed very firmly into the seat in front of them and there’s no way I could survive that especially not long-haul. Luckily I had this much leg room. The flight itself was very smooth, on time, the food was nice and the entertainment system was pretty good considering I had heard lots of bad reports in advance. 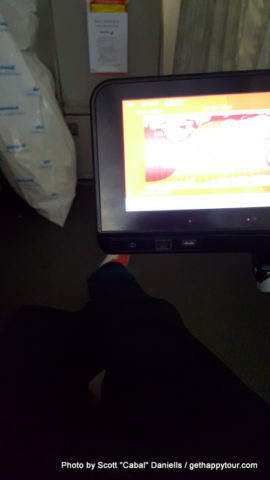 Plus, being a night flight, having the exit row meant I was able to get up and stretch my legs whenever I wanted. Although a piece of advice – don’t pick the exit row at the front of economy on the left hand side as this is by the entrance people use to board the plane and I got knocked by bags and elbows a lot. The other side should be fine. The man next to me, I think a Chilean businessman, was kind enough to let me have the window seat for descent and landing as it was my first time in South America and I was treated to some amazing views. Immigration, baggage claim and customs went very smoothly considering the long queues and I think I went from plane to arrivals in 30 minutes – so quick that Steven had not arrived yet. I took the opportunity to change some money and stretch my legs. 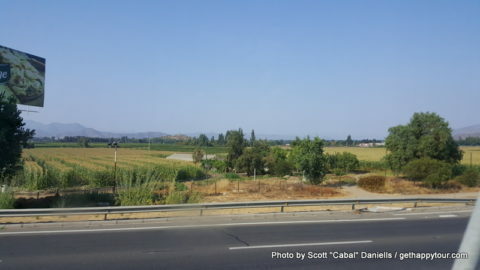 One thing you should know about Santiago airport is that there is no metro or train service to the city. They have plans to build it but it’s not there yet and so your options are taxi, private shuttle or airport bus. We took the airport bus as it’s reliable and fairly cheap, only a few thousand pesos per person. The ride into the city, to Los Heroes metro station, took around 30 minutes and from there we took the metro a few stops before taking a shared taxi to Steven’s house. 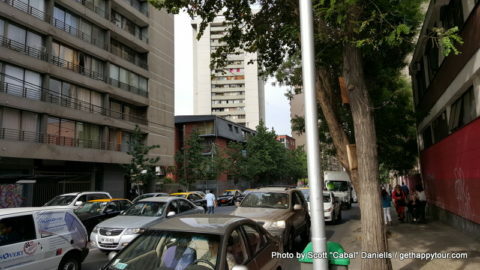 The shared taxi system will be confusing for non-Chileans but it seems efficient – they travel on vaguely set routes, for a cheap fixed fee, and leave either when full of when the egg timer they have reaches the end. I think we were in the taxi for maybe 10 minutes before we arrived in La Granja. La Granja is not an area of the city that you will ever visit as a tourist unless you have a reason as there isn’t much there. It’s a fairly residential area, I believe with houses mainly built in the past for the military, with a couple of malls but nothing for tourists. It’s also a commune which a number of guide books say to avoid but I never felt unsafe there, although granted I never went out at night. Except for a few Mormons, and the Chinese family that run a general store on the main road, there generally aren’t any non-Latinos in the area either so you will stick out like a sore thumb, unless you are Latino yourself, but this is never something that has bothered me. But as it’s an area with a certain amount of crime I didn’t take many photos. The two days in La Granja I spent mainly relaxing, adjusting to the time zone and heat, playing with Pancracia thr cat and eating some good home cooked food. Wow what food it was. We did a little bit of shopping and walking around seeing the area where Steven grew up but didn’t do too much as we knew that we would be doing a lot of walking around for the rest of my trip. We did travel a few stops on the metro one afternoon to visit the Mall Plaza Vespucio, where Steven used to work, to stretch our legs and have some coffee but that was about it. As I said this area isn’t really for tourist so you won’t really have a reason to visit here.